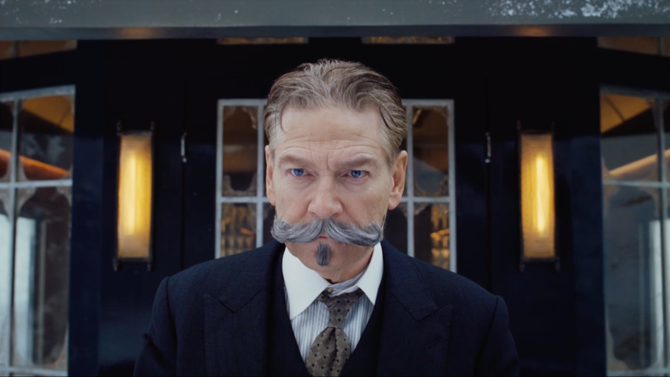 The new version of MURDER ON THE ORIENT EXPRESS surprised me in that it turned out to be a truly fun film with a surprisingly serious edge. For those who don’t know or can’t guess the plot of the film, it involves the murder of a much hated man on train one winter’s night. The body is discovered in the morning. Since the train has been stopped by an avalanche Hercules Poirot steps up to try and sort out who done it before the murderer can get away. Before you see the film divorce yourself from any thought of the earlier versions of the film. This film is not those. This is a small scale locked room mystery bumped up to a big screen (semi)action film. Some details have been changed or rearranged (the film reverse the trip from Istanbul and makes it from the ancient city). Shading such as an interracial romance have been added. While the basic mystery is the same there are enough changes that make this version worth seeing. To be honest the film isn’t perfect. The heavy use of CGI in the train travel sequences is nice but at times a little too Thomas Kinkade like. Also the fact there is a huge cast and the film runs a breezy 110 minutes means that some of the characters are short changed in development. And while some people are given moments to shine late in the game the Countess is short changed and the porter who is one of the suspects is completely a non-entity. Had I not known that he was part of the plot I would have been left scratching my head when he was seen sitting with the rest of the suspects. On the other hand I don’t think the film is fully interested in just being about the murder. I think director Kenneth Branagh has more on his mind. He’s infused his great detective with a sense of melancholy missing in other versions. We get a sense of a whole sea of emotions and backstory in his responses to characters and the phot of the mysterious Katherine. While there is no answers regarding Katherine there is still a sense it means something deep. Branagh also infuses him with deep sense of regret about choices not made. I love that there the character now has a real backstory. It’s a wonderful addition that humanizes Agatha Christie’s thinking machine. Additionally the film is very much a rumination of the notions of what is justice. Where previous versions of the tale have danced around the notion here the film wades in with both mediations on what is the right thing to do as well as forcing us to ponder if we can correct the mistakes and wrongs of the past. What is more important true justice or the justice of Man’s law? It is something that Branagh debates more and more as he follows the clues to their solution. It’s a plot thread that comes to fruition when Poriot figuratively takes on the sins of the world in the finale when the Christ Like detective confronts the suspects who are arranged around a table like at Da Vinci’s The Last Supper. While it is a tad heavy handed it even if it works, it’s a clear indication that the film’s final third isn’t about just finding a killer but redemption. It’s a brilliant move that lifts the film up from being a mere mystery into something more. In its way the ending left me shattered. I never expected something so mature from what many people consider a simple mystery. I may be wrong but I have a strong sense that the filmmakers were very influenced by Christie’s final Poirot tale Curtain which ends on a melancholy note which if connected with this film would show him still pondering what is right until the very end. I really loved this film. From its witty lines to it brooding solution, Kenneth Branagh’s MURDER ON THE ORIENT EXPRESS is an unexpected joy. It is a rough around the edges masterpiece that is worth your time and money. One of the great surprises of 2017.